You cant have just one. Good evening, everyone! It's been a number of years since I've been active around here. I joined the forum in 2011 when I was 14 after winding up with a black 82 928 that a guy was parting out. Shortly thereafter, I bought a 83 928s that was more complete but had a bad transmission. It came with a replacement that was supposed to be good. In 2012, I changed the transmission by myself in the driveway after my parents left for a night out. Got it all together to find that the replacement was also garbage. I searched around for another transmission for a while with no result. After that, I pretty much lost motivation and they've both sat. About a year ago, a friend of mine starting noticing 928's. Not long after, he found and bought a 78 5 speed. It's #111 IIRC. Engine is supposedly bad and it came with a used replacement engine with receipt. It is mostly complete, save for little stuff. It also looks rougher than it is; it's near arrow straight. Around the same time, he bought a 68 Plymouth GTX. He's more of a Mopar guy, and wants to focus more on it so yesterday he told me he was considering selling it. Somehow, I talked him into trading it straight up for a 81 El Camino with a 305 that I got for free. 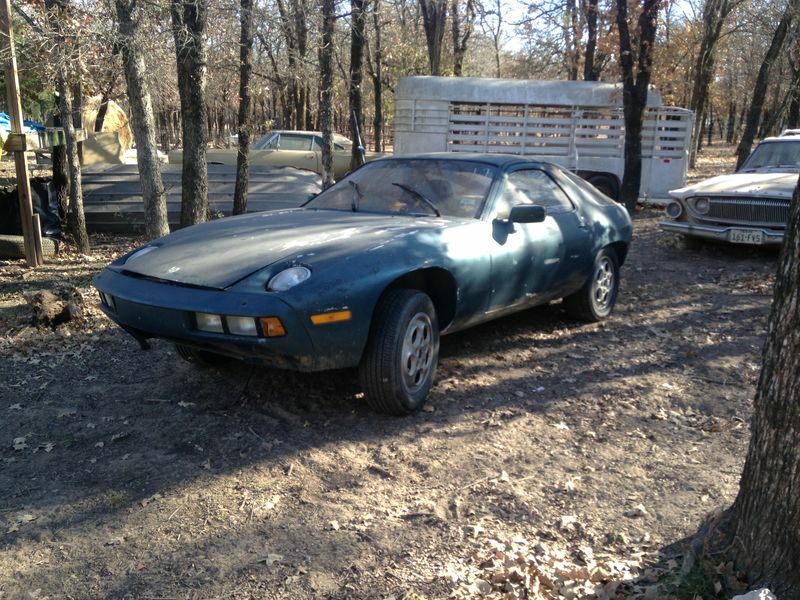 The 928 needs quite a bit of money put into it, but I'll have nothing in it, which helps. Sorry for the long post! I'm going to start lurking around here again to refresh my memory on these. My senior year of college starts tomorrow, so we'll see how much I get to work on it. Last edited by 1982_928; 08-26-2018 at 07:52 PM..
Texas is a big place. In which part do you live, and what school do you attend? Lots of help in the DFW area for 928 owners. welcome to the club - so do you still have the 82 and 83? - are you going to try and restore all 3 or make one from all the parts? Thanks, Stepson! I live west of Fort Worth in Weatherford. I'm attending Tarleton at Stephenville. Honerboys, I do still have the 82 and 83. Both of them are buildable cars, so I'd like to eventually put them together as well. Whether or not it'll happen is a different story, but that's at least the plan for now. The 83 needs paint, interior and a trans. It runs great, or at least did the last time I ran it. It doesn't have any fuel in it which should help with sitting. The 82 needs an engine, gas tank and a few other little things. It has driver quality paint on it still. Both are under cover so they aren't hurting too bad. The engine out of the 82 had antifreeze corrode a into a cylinder. Since the "bad" engine from the 78 (Which rotates over fine, not sure exactly whats wrong with it yet) and the engine from the 82 are both 4.5's, I hope to be able to have enough usable parts to put together a good runner. The DFW monthly breakfast is this Saturday at 8am. I believe we are still meeting at Bacon's Bistro on Hwy 26 in Hurst. That's about a 45 minute drive for you? You do not have to drive a 928 to attend, although there may be more 928s there than you have ever seen in one place before. Make a parts list for each car before you come. Several of us have extra parts or parts cars that might have the parts you need. In addition, Roger Tyson of 928sRus usually attends. We can talk about your goals and maybe set up a tech session to help. There is a regular poster on this forum who probably lives the closest to you. He is a bottom-feeder and a legitimate thread-killer and very knowledgeable about these cars. I'll let him chime in if he chooses to participate. Anyway, if you can come to the breakfast, you should be able to gain a lot of knowledge. Looks like my reply from earlier today didn't post. Oh well, here we go again. Yep, Hurst isn't very far at all. Is the meet an all inclusive Porsche meet or just 928's? I didn't know there was a meet that close to me. I already have another meet to go to with some family this Saturday morning, but I will be sure to look up the dates and put it on my calendar for next month. I assume you're local to the DFW area as well? I've never seen more than 2 928's in the same place (mine), so I'm sure there will be more than I've seen before! It'll be a week or two before I get a chance to bring the car home, but shortly thereafter I will begin taking inventory of what I have and figure out what I need. The lack of a parts source is the main reason neither of my other cars are on the road. I'll be ecstatic if I can find some people with spare parts they're willing to part with. I very rarely ask for physical help, but I'm always open to tech help. I knew some about the cars back when I was working on my other two, but I'm sure I forgot most of it. I'm relatively mechanically inclined so I'm not daunted by the work too much, but I will definitely need some advice, especially when it comes to the fuel system. The only experience I have with CIS is on a Mercedes 190e that I have around, and I cant get it to run right to save my life. I hope this 928 is a different story! Last edited by 1982_928; 08-28-2018 at 05:13 PM..
PM me your phone number and I'll give you a call sometime tomorrow. I have owned 8 928s and 7 at one time. They just kept following me home. Too bad you can't come to the breakfast. You would leave the GTG so pumped, you would HAVE to work on one just to calm down. The bottom feeding thread-killer that lives close to you is very good at CIS injection. If he's at the breakfast, i will mention to him your dilemma. Everything you would need for your car is located within 100 miles of your door. You just need to meet everybody and find out who has what. Great! I'll PM you my number here in a minute. If I don't answer, its probably because I'm in class. I'll call back when I can. Thanks for the parts info! You're definitely increasing my motivation to get some work done. I do have a feeling that my wallet is going to be extremely light after I start working on this thing, though! You will probably be surprised. Just make a good parts list for each car. That way you can prioritize which parts will get which car rolling. It is no fun to constantly work on a car and not be able to drive it. I worked on my Schwartz car for 4 years, drove it twice and realized it needed head gaskets. Put it to the side, bought the Stepson. Reanimated it and drove it to SITM (Sharks in the Mountains in North Carolina) and then Third Coast (In Marble Falls, the first weekend in November each year-mark it on your calendar). I had the most fun I ever had with my clothes on and have been at it since. Even though you don't typically ask for help working on your cars, you might be amazed what a group of guys can do in an afternoon. Just might be worth it to you. I'll make a good parts list. My main focus will be on the 78, since it's a 5 speed. I'm sure the Automatic cars are plenty fun to drive, but the AT's have already put a bad taste in my mouth. Plus, I just like driving a stick better. I'm no stranger to working on cars and not being able to drive them; that seems to be the story of my life. There's always something on project cars that tries to deter me. Seems like you're plenty familiar with that! I'll put the Third Coast event on my calendar! The place that I'll be working on and storing the car is on a piece of property where my father stores most of his old cars. He generally doesn't let people he doesn't know well go out there. I personally have no problem with a tech session, but I have to respect his wishes; especially since I'm able to store them there for free. I'll have a talk with him about it when the time comes. Last edited by 1982_928; 08-29-2018 at 09:04 AM..